Progressive Delivery in Kubernetes: Blue-Green and Canary Deployments. Progressive Delivery is used by Netflix, Facebook and others to reduce the risk of deployments. But you can now adopt it when using Jenkins X. Progressive Delivery is the next step after Continuous Delivery, where new versions are deployed to a subset of users and are evaluated in terms of correctness and performance before rolling them to the totality of the users and rolled back if not matching some key metrics. In particular we focused on Canary releases and made it really easy to adopt them in your Jenkins X applications. Canary releases consist on sending a small percentage of traffic to the new version of your application and validate there are no errors before rolling it out to the rest of the users. Facebook does it this way, delivering new versions first to internal employees, then a small percentage of the users, then everybody else, but you don’t need to be Facebook to take advantage of it! You can read more on Canaries at Martin Fowler’s website. If you already have an application in Jenkins X you know that you can promote it to the “production” environment with jx promote myapp --version 1.0 --env production. But it can also be automatically and gradually rolled it out to a percentage of users while checking that the new version is not failing. If that happens the application will be automatically rolled back. No human intervention at all during the process. NOTE: this new functionality is very recent and a number of these steps will not be needed in the future as they will also be automated by Jenkins X.
Istio: a service mesh that allows us to manage traffic to our services. Prometheus: the most popular monitoring system in Kubernetes. Flagger: a project that uses Istio to automate canarying and rollbacks using metrics from Prometheus. This will enable Istio in the jx-production namespace for metrics gathering. Now get the ip of the Istio ingress and point a wildcard domain to it (e.g. *.example.com), so we can use it to route multiple services based on host names. The Istio ingress provides the routing capabilities needed for Canary releases (traffic shifting) that the traditional Kubernetes ingress objects do not support. The cluster is configured, and it’s time to configure our application. Add a canary.yaml to your helm chart, under charts/myapp/templates. Soon, both the canary.yaml and values.yaml changes won’t be needed when you create your app from one of the Jenkins X quickstarts, as they will be Canary enabled by default. That’s it! Now when the app is promoted to the production environment with jx promote myapp --version 1.0 --env production it will do a Canary rollout. Note that the first time it is promoted it will not do a Canary as it needs a previous version data to compare to, but it will work from the second promotion on. If the metrics we have configured (request duration over 500 milliseconds or more than 1% responses returning 500 errors) fail, Flagger then will note that failure, and if it is repeated 5 times it will rollback the release, sending 100% of the traffic to the old version. would provide us with a view of different metrics (cpu, memory, request duration, response errors,…) of the incumbent and new versions side by side. Note that Istio by default will prevent access from your pods to the outside of the cluster (a behavior that is expected to change in Istio 1.1). Learn how to control the Istio egress traffic. If a rollback happens automatically because the metrics fail, the Jenkins X GitOps repository for the production environment becomes out of date, still using the new version instead of the old one. This is something planned to be fixed in next releases. 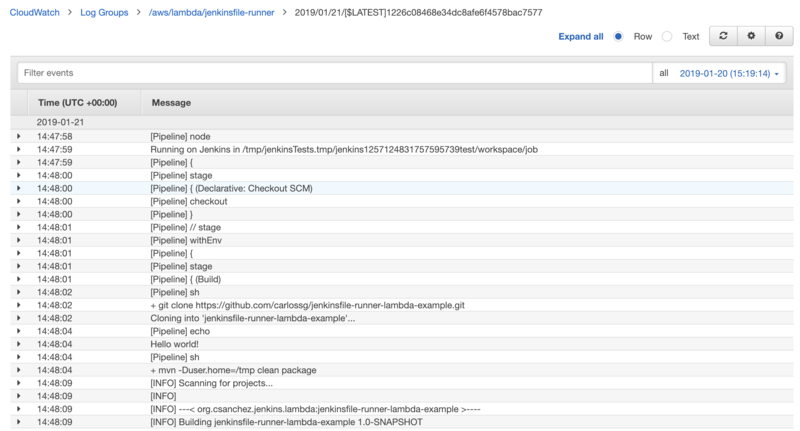 The Jenkinsfile-Runner-Fn project is a Fn Project (a container native, cloud agnostic serverless platform) function to run Jenkins pipelines. It will process a GitHub webhook, git clone the repository and execute the Jenkinsfile in that git repository. It allows scalability and pay per use with zero cost if not used. This function allows Jenkinsfile execution without needing a persistent Jenkins master running in the same way as Jenkins X Serverless, but using the Fn Project platform (and supported providers like Oracle Functions) instead of Kubernetes. The function is very similar to the one in jenkinsfile-runner-lambda with just a small change in the signature. The main difference between Lambda and Fn is in the packaging, as Lambda layers are limited in size and are expanded in /optwhile Fn allows a custom Dockerfile where you can install whatever you want in a much easier way, just need to include the function code and entrypoint from fnproject/fn-java-fdk. Oracle Functions is a cloud service providing Project Fn function execution (currently in limited availability). jenkinsfile-runner-fn function runs in Oracle Functions, with the caveat that it needs a syslog server running somewhere to get the logs (see below). See the jenkinsfile-runner-fn-example project for an example that is tested and works. You can add your plugins to plugins.txt. You could also add the Configuration as Code plugin for configuration. Other tools can be added to the Dockerfile. Add a GitHub json webhook to your git repo pointing to the function url. More information in the Jenkinsfile-Runner-Fn GitHub page. Last year has been quite prolific for the Jenkins Kubernetes Plugin, with 55 releases and lots of external contributions! In 2019 there will be a push for Serverless Jenkins and with that a shift to make agents work better in a Kubernetes environment, with no persistent jnlp connections. You can watch my Jenkins X and Serverless Jenkins demo at Kubecon. Jenkins is an example of an application that can take advantage of Kubernetes technology to run Continuous Integration and Continuous Delivery workloads. Jenkins and Kubernetes can be integrated to transparently use on demand containers to run build agents and jobs, and isolate job execution. It also supports CI/CD-as-code using Jenkins Pipelines and automated deployments to Kubernetes clusters. The presentation and demos will allow a better understanding of how to use Jenkins on Kubernetes for container based, totally dynamic, large scale CI and CD.